Smart Communication silently introduced the new LTE Prime Pro, a new data package with up to 3 GB of open data for both prepaid and postpaid subscribers. The new LTE Prime promos! First reported by our friends from Teknogadyet, the LTE Prime will come in two options. LTE Prime 50 and LTE Prime 100. 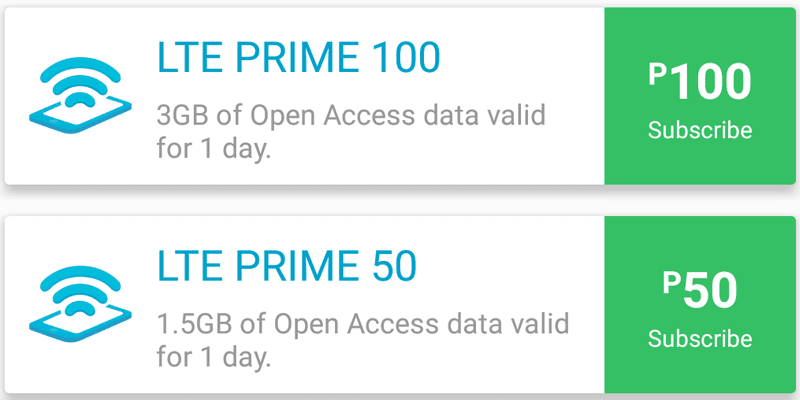 The LTE Prime 50 offers 1.5 GB of data which is 0.5 GB bigger than the regular GIGA50 package. On the other hand, the LTE Prime 100 has whopping 3 GB of data compared to 1.5 GB of GIGA99. The promo is only valid for 1 day. All you need do do is text LTE50 or LTE100 and send it to 999. However, this new data package from Smart won't come with extra consumable data for YouTube and other video streaming apps. We are also not yet sure if this has FREE Facebook like the GIGASURF promos. So far, we strongly recommend this for heavy mobile data users. It would be great for users who plays games, loves to download lots of files, and video streaming. We also think that this could be a very helpful data package for those content creators and business people on the go.